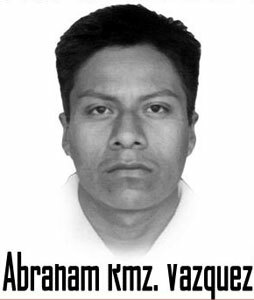 On Saturday, January 31, at 6:00 p.m. a heavily armed commando unit of the Oaxaca state police went into the San Pedro Pochutla prison and took our indigenous comrade and political prisoner Abraham Ramírez Vásquez away in a white van with no license plates to an unknown address. Abraham and two other indigenous men, Juventino and Noel García Cruz, have been held prisoner since January 15, 2005, under the direct orders of the murderer Ulises Ruiz Ortiz (URO). Our comrades’ crime was defending their forests and their traditional practices and customs. For more than 4 years, the URO government has been unable to prove that they committed the crimes they are accused of, and accordingly, they have not been sentenced. Our comrades are members of the Committee for the Defense of Indigenous Rights (CODEDI) of Santiago Xanica, a member organization of the Magonista-Zapatista Alliance (AMZ), the Popular Assembly of the Peoples of Oaxaca (APPO), and adherent to the Other Campaign. It’s important to note that Abraham Ramírez is a man of deep libertarian and human convictions, which have motivated him more than once, even from inside the prison, to struggle against the prison authorities for prisoners’ rights. During all these years, Abraham has stayed in contact and written letters encouraging the people of Oaxaca to resist and not to allow their dignity to be trampled on by the killer who misgoverns this state. Prison bars have not been able to silence his rebellious voice, and he and the other two comrades held prisoner with him have sent letters and greetings to several different events initiated by the Other Campaign. Abraham is also directly involved in the organization of a popular kitchen inside the Pochutla prison due to the fact that the prisoners have no dining room in this prison. This activity has lead to harassment, hostility, and acts of aggression against him by prison authorities. In view of this situation, we ask for the sensibility and solidarity of the Mexican people and social organizations to demand that the killer Ulises Ruiz Ortiz and the right-wing Calderón government immediately present our comrade Abraham Ramírez Vásquez alive and that they release all the political prisoners of Santiago Xanica. We hold the prison warden, the governments of Ulises Ruiz and Felipe Calderón responsible for any attempt against our comrade Abraham. Respectfully yours: Alianza Magonista Zapatista. FREE ALL POLITICAL PRISONERS OF MEXICO AND THE WORLD! I write to you very concerned about an unlawful kidnapping that happened yesterday in Oaxaca. It has come to my attention that on Saturday, January 31, at 6:00 p.m. a heavily armed commando unit of the Oaxaca state police went into the San Pedro Pochutla prison and took prisoner Abraham Ramírez Vásquez away in a white van with no license plates to an unknown address. This sudden disappearance is outrageous and violates every human right Mr. Ramírez Vásquez has as a citizen of Mexico. Word of this disappearance is spreading fast throughout the United States and people are demanding that Vásquez be located immediately. Your help in this matter is greatly and urgently needed. Please contact Governor Ulises Ruiz Ortiz and pressure him to find and safely return Abraham Ramírez Vásquez and to take action against those who kidnapped him. I write to you outraged about an unlawful kidnapping that happened yesterday in Oaxaca. It has come to my attention that on Saturday, January 31, at 6:00 p.m. a heavily armed commando unit of the Oaxaca state police went into the San Pedro Pochutla prison and took prisoner Abraham Ramírez Vásquez away in a white van with no license plates to an unknown address. Your help in this matter is greatly and urgently needed. You must investigate Governor Ulises Ruiz Ortiz’s involvement in this disappearance, pressure him to find and safely return Abraham Ramírez Vásquez IMMEDIATELY and take action against those who kidnapped him. I write to you on behalf of Abraham Ramirez Vasques, who has been held captive for a much to long time without trial in San Pedro Pochutla Prison/Oaxaca. Abraham Ramires Vasques has now been secretly been transferred from that prison and obviuosly his friends and relatives do not know his whereabouts or even if he is still alive. you should consider to rightly exercise your duties as …. and help Mr.Ramires Vasques to obtain all his rights as a human beeing and specially as citizen of Mexico. political prisoners since january 2005. We strongly reccomend that Abraham Ramírez Vásquez moves back to Pochutla penitentiary, because he has the right to see his family and he is not a dangerous criminal but a political prisoner. We also think that the director of Pochutla penitentiary, Juan Noel Ramírez Medina, must be removed from his office being a direct actor of this human rights violation, carried out towards Abraham Ramírez Vásquez, Noel García Cruz e Juventino García Cruz. We are worried about this situation, it represents an escalation of violence towards all members of CODEDI – XANICA. Hoping that this attacks to human rights of indigenous people of Xanica stop, and that this state of impunity comes to an end, we will keep attention to every future event.